After the first two EMCEF conferences took place, in 2009 & 2010, the idea was raised to build a CPD event around the annual West Midlands region meeting of College fellows and members. The intention was to attract more people to that annual meeting, using CPD as the incentive. The lead for this event is the College's regional rep. We aim for talks which focus more on the specialty itself, the careers within it and the lives of its practitioners in the region. EMCEF provides the logistics. Posters are welcome. This event has been free to all participants from the outset and welcomes emergency medicine clinicians of all professions and grades. The original title was EMCEF West Midlands. This initial event was held at UHCW, Coventry, in January, 2011. It was attended by 75 people and the feedback provided suggested that it was a welcome addition to the CPD calendar. The 3rd conference of this type – EMCEF 10, in January, 2013 – included our first trainee presentation competition. This has continued since and, in 2014, at EMCEF 13, was named the Karen Parry Memorial Prize. 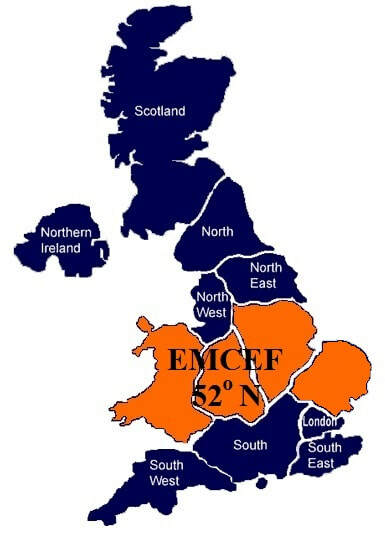 In acknowledgement of the growing involvement of and contributions from colleagues from our sister regions to the East (East Midlands) and West (Wales), the new title and focus was developed in time for EMCEF 17, in 2015. For those who have the time to kill and very little to kill it with, it won't take long to discover that 52.5 degrees would have been slightly more accurate, in a geographical sense. But 52 sounds better, I think. We eagerly welcomed the increasing contribution and support from among our colleagues in the East Anglia region, although they do find it tougher to tear themselves away from the proximity of London. Still, by the time EMCEF 25, in 2017, we had added East Anglia as well. What else is added to this forum depends on the wishes of those who attend. I am certain that there are many ideas out there for what can be done with it. Please use the CONTACT section of this website to bring these ideas to my attention.